Burrata. The one food I can never, ever pass up. For those of you who don’t know, burrata is a cheese made from mozzarella and cream. Side by side, burrata and fresh mozzarella look very similar. The burrata might look a little less sturdy, heavier, and slightly bulging, though. That’s because the inside is filled with stringy curd and cream. 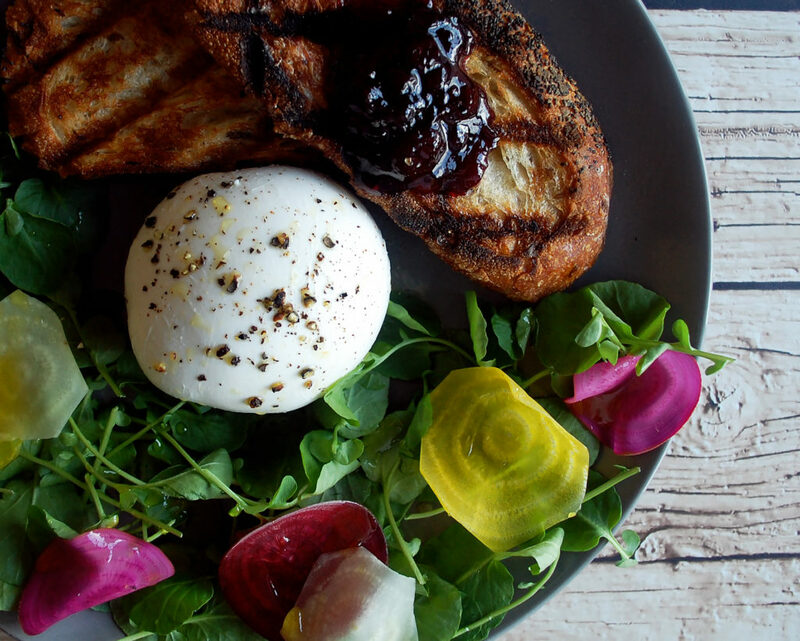 When you slice fresh mozzarella, you get even, smooth slices. 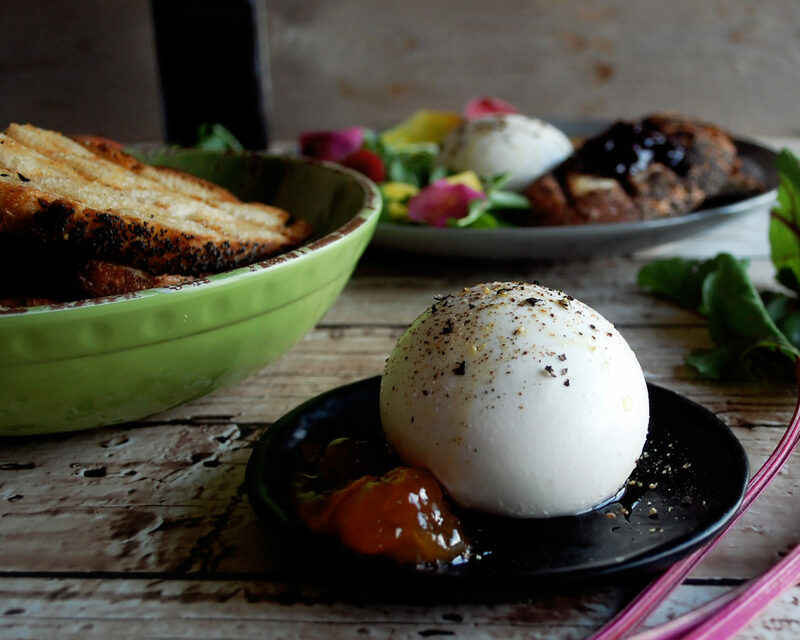 When you cut into burrata, the outside stays firm while the inside breaks into a rich and creamy pool of cheesiness, begging to be slathered onto a warm piece of bread. I can’t remember exactly when this happened, but after a certain point, it became impossible for me to see burrata on a menu and not order it. I think it’s because every time I happened to order it previously, it was always amazing. And therefore, I have decided that as long as there are a few key elements on the plate, you can’t mess up burrata. First, olive oil. The burrata is already creamy enough, with tons of moisture coming from the cream. But an extra layer of fruity, slightly bitter, high quality extra-virgin olive oil is much needed. 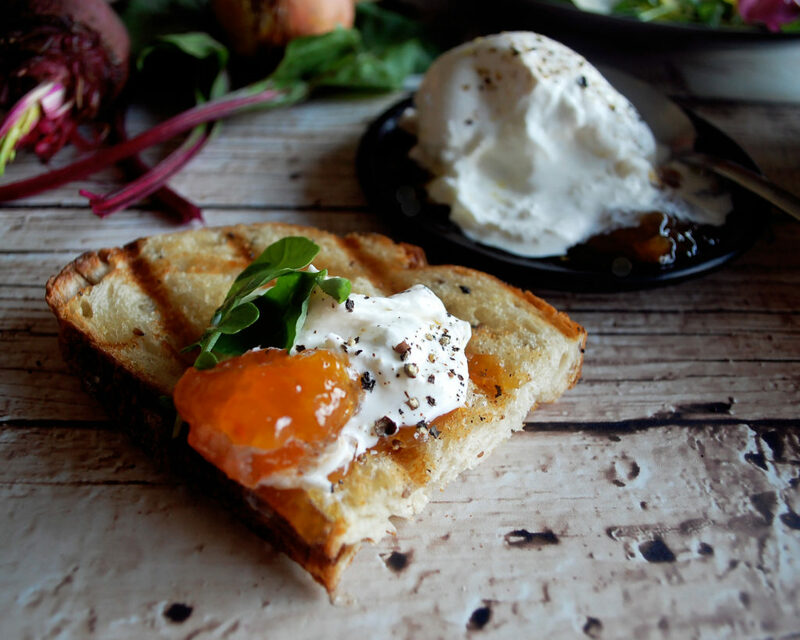 When the burrata splits, the olive oil drizzles down the sides and blends with the cream on the plate. Second, seasoning. No soft, fresh cheese is complete without the proper seasoning. Forget the finely ground table salt and powdery black pepper. You want flaky sea salt, so that it brings out the beautifully simple flavor of the cheese. And you want course pieces of black pepper, freshly cracked, to give a strong peppery bite. Third, something tangy. 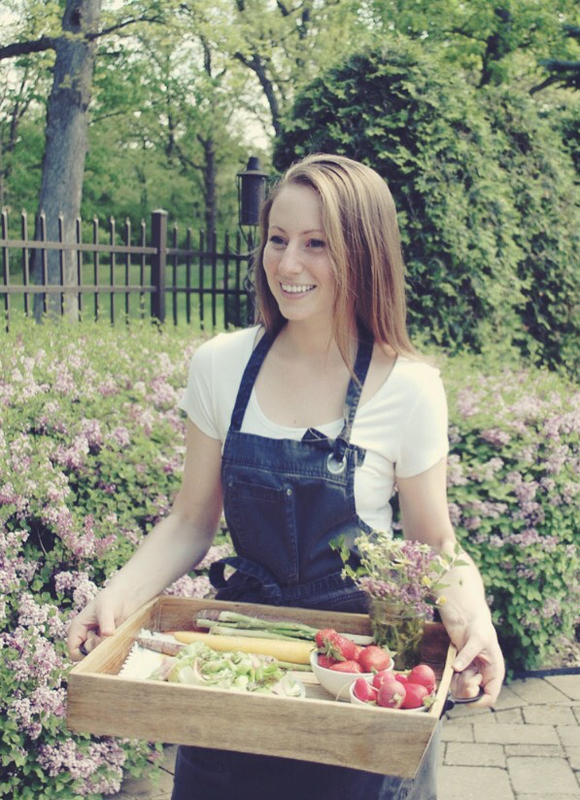 Think pickled vegetables or even citrus. Anything to brighten up the rich flavor of the cheese. Here I’m using an acidic vinaigrette and fresh lemon juice on the beet salad. Fourth, something sweet. I usually go for a simple fruit jam. You can get more creative by combining the tangy and sweet elements in a mostarda or even pickled fruit. Finally, bread. This is absolutely the most crucial element. 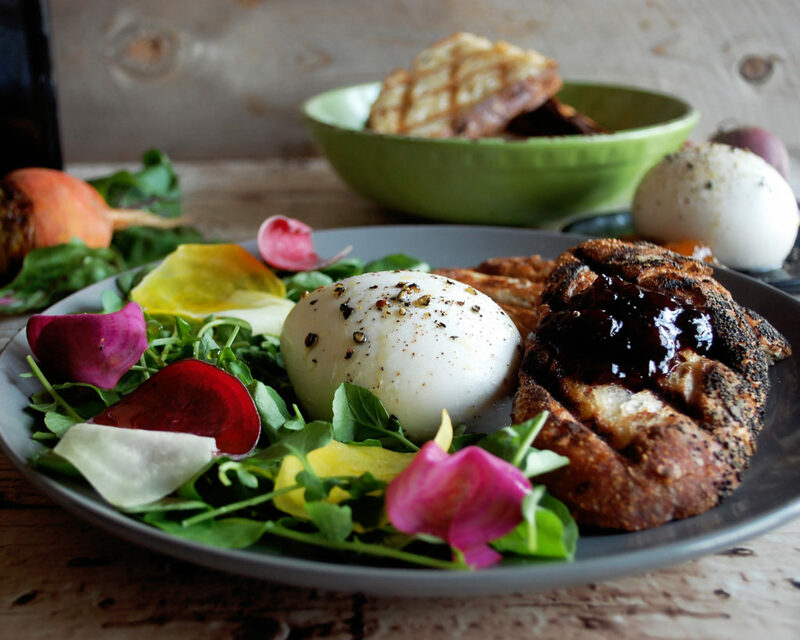 Break the burrata, spread it onto the bread (preferably grilled or at least toasted), spoon some jam on top and garnish with the greens. It’s the perfect bite. Enjoy! Whisk together the apple cider vinegar and olive oil. Season with salt and pepper to taste. Set aside. Trim the ends off each beet. Peel the skins off. Using a mandolin, slice the beets paper thin. Preheat the grill (or heat a grill pan if working inside). Brush each slice of bread with a generous amount of oil on both sides. When the grill is hot, grill the bread until you see dark grill marks, flipping quickly so the bread doesn’t burn. Transfer the bread to a plate and season with salt when hot. Arrange the watercress on a plate with the shaved beets scattered throughout. Drizzle the vinaigrette onto the salad, adding a squeeze of lemon juice over top. 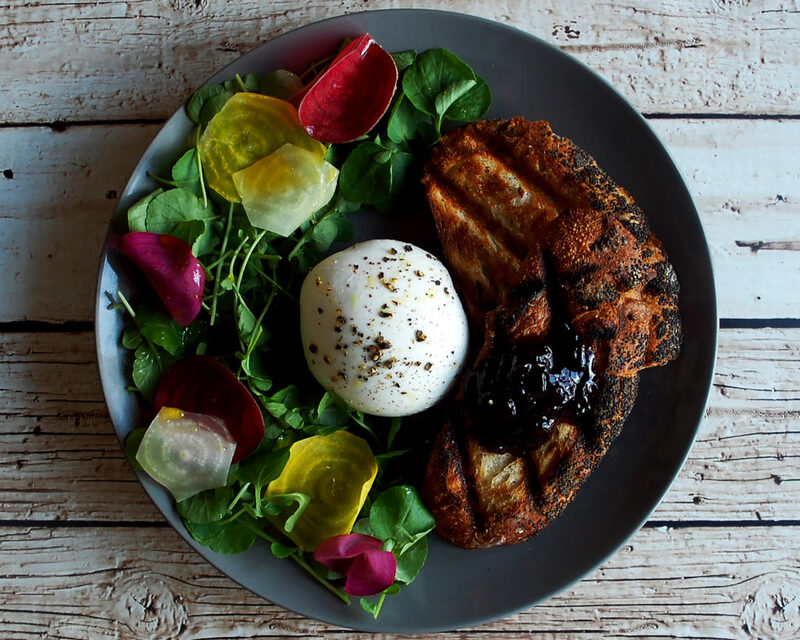 Place the burrata onto the plate. Season the top with a good pinch of sea salt and a few cracks of course black pepper. 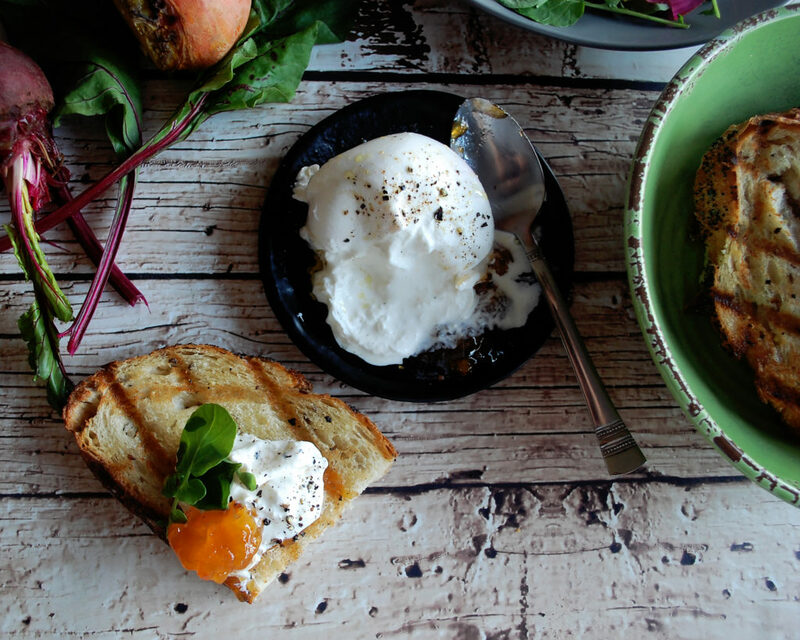 Drizzle the burrata with the extra-virgin olive oil. Spoon the apricot and cherry jam alongside. 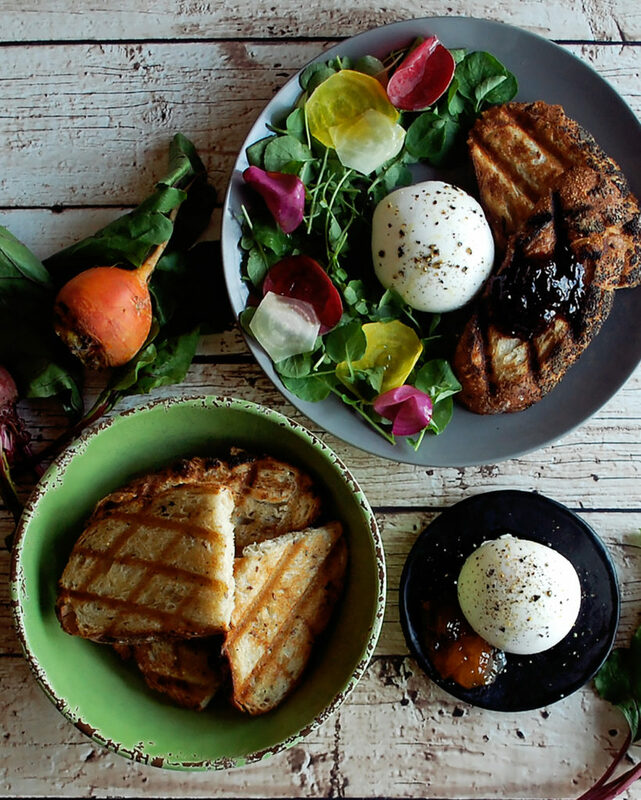 Serve the burrata and beet salad with the grilled bread. Red beets will stain your cutting board, knife, hands, etc. A few tips I have are to wear gloves, work with the red beets last after all your other knife work is done, and to wash your cutting board/knife immediately so the color will easily come off.